A Gourd Birdhouse is fun to make and an easy and a unique project. You can make the bird house as a practical and usable birdhouse or just for decoration inside, or outside your home. Cured gourds are just about as tough as plywood and will last up to 30 years if you take care of them. The first thing you need to do is clean your gourd. You can use warm soapy water or even bleach water. Use a fine steel wool and scrape off the mold that is on the gourd. You will be suprised at the design you find when you clean them. To make your birdhouse drill a diameter hole in the side of the gourd. It depends on what type of bird you are trying to attract. Purple Martins need a 2 1/8 inch hole. House wrens need a 1 inch hole and Chickadees need a 1 1/4 inch hole. Tree swallows and Bluebirds need a 1 1/2 inch hole. You will need a hole saw attachment for your drill for this. Place the gourd in an upright position in a holding vise. It's a good idea to pad the gourd where it comes in contact with the vise, so that no damage occurs to the outside of the gourd. This will be the bird’s front door. Remove the dried seeds and fibers. Drill two or more ¼” holes about 1 1/2” up from the bottom of the gourd for drainage and ventilation. You will also need to drill a small hole in the very top of the gourd neck. Go all the way through the gourd, as this is where the hanger will be. Scrape the seeds from inside of the gourd and save these seeds to plant next year. Just spread them out, and let them dry out before you package and label them. You are now ready to finish your gourd birdhouse. There are many ways to decorate these cute birdhouses. You need to decide if they are going to be for inside decoration or for a real outdoor birdhouse. The various decorations for the gourds are only limited by your imagination. I have seen them with ladybugs, butterflies or flowers. You can even just paint them a solid color but I prefer the natural color of the gourd. You first need to sand the gourd smooth and they paint it with an oil based primer then allow to dry. Now paint the gourd house with any color exterior enamel paint. If you use water based latex paint it will probably peel. You need to apply 2 coats and please be careful not to clog the drainage holes. Acrylic craft paint works fine, or Permanent markets if you are just going to use them for decoration in your home. After you have put your design on them the gourds will need two coats of polyurethane if you use acrylic paint. Hang the gourd house in a sheltered area at least 6 feet from the ground. Just put twine through the holes that you drilled on top and hang it up. After the season is over you need to take them down and clean out the inside of the nest. 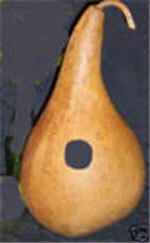 These gourd birdhouses make wonderful gifts, for holidays, or birthdays. Children love to decorate the gourd birdhouses and they come up with some mighty fine ideas. If you have any ideas for a gourd bird house and would like to share them with us please contact me and I will add your idea.